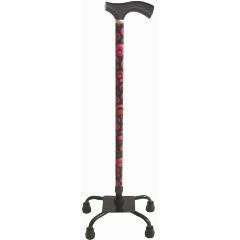 AllegroMedical.com presents The Switch Sticks Quad Sticks Cane. For those needing a little extra support, quad sticks are unique in that they offer reassurance with style. In a range of contemporary designs with four feet, they simply stand ready for your use. The quad stick has 4 points of contact with the ground providing increased stability and extra support when walking. Circles was designed using a black shaft with red, pink and purple accents to create a retro look and feel. Switch Stick's Huntington design brings out the nature-lover in you with its variety of green tones and classic stripes pattern.